DETROIT, Oct. 27, 2017 /PRNewswire/ -- A more typical Michigan winter is expected this year, in contrast to last year's unseasonable warmer winter temperatures. As the cold weather sets in, DTE Energy is advising Michigan residents to start planning now for colder temperatures and the resulting increased use of natural gas. "As the temperatures begin to dip, we expect to see an increase in natural gas use across our territory this winter season, with demand estimates up about 9 percent over last winter," said Dan Brudzynski, DTE vice president of Gas Sales and Supply. Brudzynski added that DTE buys gas in summer, when prices are typically lower, and stores it for winter use – keeping natural gas prices more stable during the coldest months. "The good news is the actual price of natural gas will be lower than last winter, and remains near its low point over the past 10 years. Still, we encourage everyone to be prepared for winter by taking steps to save energy and keep their homes warm, efficient and safe before the cold weather hits," said Brudzynski. DTE encourages customers to take proactive measures to reduce their natural gas usage by installing programmable thermostats, increasing insulation and weatherproofing drafty air leaks to stay warm and comfortable this winter. More money- and energy-saving tips and information are available on DTE's website at www.dteenergy.com/staywarm. If Michigan does experience a typical winter, DTE customers in southeast Michigan will spend, on average, $20 to $30 more over the six-month heating season compared to the same six-months last year. This number could vary across the state in different temperate regions. DTE passes its actual cost for natural gas on to customers with no mark-up. Earlier this year DTE passed through a 9 percent reduction in the price of natural gas which remains in effect today. Customers can find more information about DTE's buying strategy and other steps the company is taking to keep prices low at www.dteenergy.com/price. DTE Energy service tech. 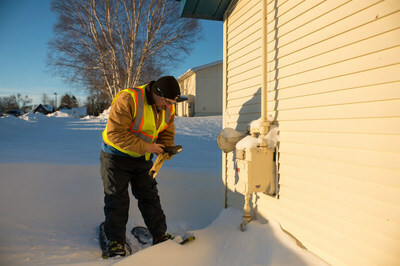 reads gas meter in Sault Ste. Marie, Mich.